It is an existential, intimate book, of easy reading and spontaneous humor, which shares with the reader the experience and emotions of a woman who, at the age of fifty five, after having remained inside a cardinalate with all his decisive life, decides to realize a trip alone to another side of the world: to the India, country that as tourist she had visited already in other occasions and of which she had stayed prendada. She takes this decision because she knows that to reach the fullness is necessary to assume risks, to measure forces, to know her own limits. Beyond social conventions, of what they will say, without having to prove anything before anybody. More that before her itself, she leaves behind family, comforts, social structure, to penetrate in a foreign world, ado resources that her own person. To go to the meeting of her itself, and she achieves it. She manages to know clearly what is and what is not capable, her powers and his limitations to return to hers revitalized, with a more wide and complete vision of the world and those who in her live. 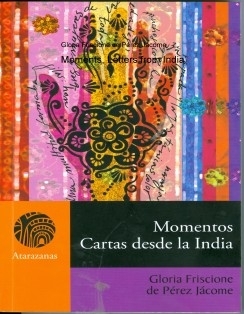 The authoress, Gloria Friscione of Perez Jácome, studied Social Anthropology as response to his basic interest: the human being and the diverse ways that he finds to express in community. Her taste for writing demonstrated from small, " if I want to clarify an idea, to conspire a feeling or a situation, to lengthen an instant; if I am sad or satisfied, when an emotion exceeds me, of what another way can I it demonstrate better that writing " Carried away of the Literature, she is sure that the salvation can be across her; because of it her has travelled since she has use of reason. Her another passion, the trips, has led her to knowing remote countries, different cultures and human extraordinary beings. She has published, besides diverse articles about fascinating trips, two books: "India, Love to The First Sight and "Moments, Letters from the India ". At present she prepares a third party on religious Mexican festivities: "Of Holiday in Holiday ".